Cait Tracy (left) of Hermon High School is pictured going after a rebound with Presque Isle's Rebecca Rider during a 2018 tournament game. Tracy sparked the Hawks to victory over MDI on Thursday might. 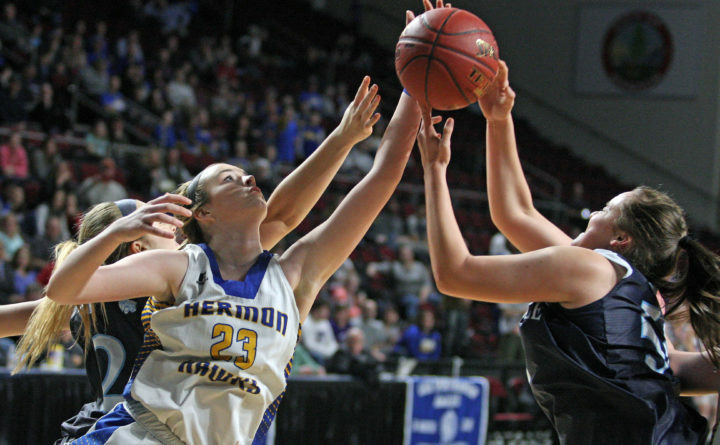 HERMON, Maine — Hermon High School senior forward Cait Tracy missed a healthy portion of last season with a broken wrist but she’s making up for lost time this season. The 5-foot-10 Tracy poured in a game-high 18 points and also had four rebounds, four steals and two assists on Thursday night to lead undefeated Hermon to a 47-33 girls basketball victory over Mount Desert Island. Madi Curtis and Brooke Cowan combined for 21 second-half points after being held scoreless in the first half as the Hawks (10-0) pulled away after leading 12-10 at halftime. The Hawks outscored MDI 19-8 in the third quarter to build a 13-point lead and went on an 8-2 run to start the fourth quarter to distance themselves from their visitors. Tracy had eight of her points in the third quarter, including a 3-pointer and a traditional three-point play, and Cowan nailed a pair of 3’s. “I expected them to double down on me, so I had to take a couple of outside shots,” said Tracy. Cowan missed her only two shots in the first half but came through in the third period by hitting both of her 3-point attempts. “Their defense was really strong on me in the first half so, in the second half, I focused on really moving around and relocating for a pass outside and then I just shot,” said Cowan. MDI coach Brent Barker said they had to collapse down low in the second half to try to neutralize Tracy. Curtis finished with 12 points and two assists and Cowan produced nine points. Grace Page chipped in with five points, 10 rebounds and two assists and Paige Plissey contributed five rebounds, four assists and three steals to go with three points. “We knew they were going to double down on Cait in the second half so Brooke and Madi were going to have to step up and they did,” said Cameron. Julila Watras had a double-double for MDI (9-2) with 14 points and 10 rebounds. She also had two assists. Maddy Candage netted nine points and grabbed nine rebounds although she spent long stretches on the bench with foul trouble. The absence of the talented Candage hurt the smaller Trojans. “It was very frustrating, for sure,” said Candage, who picked up her third foul in the final minute of the first half and her fourth with 5:25 remaining in the third period. Alexis Clarito had two assists and two steals along with three points and Rachelle Swanson had three steals and a basket for MDI. Hermon’s man-to-man defense held MDI to three baskets and just 10 points in the second and third quarters combined. “They definitely played really good defense. Their energy is insane,” said MDI senior guard Watras. “They also made a lot of hard shots. You have to give them credit. “We played great defense in the third quarter and got some separation and we rode that in the fourth quarter,” said Cameron. Hermon has not given up more than 37 points in a game this season and is surrendering only 30.7 points per game. MDI, behind four points apiece by Candage and Watras, led 8-3 after the first quarter but Tracy had six points in the second quarter as Hermon outscored MDI 9-2 to take the 12-10 lead at halftime. MDI missed all five of its field-goal attempts in the second period. MDI shot just 33.3 percent from the floor compared to Hermon’s 47.2 percent, which included a 12-for-17 showing (70.6 percent) in the second half.